Eine der beliebtesten Aquarienpflanzen. Die Mooskugel baut Schadstoffe wie Nitrit und Nitrat aus dem Wasser ab und liefert Sauerstoff. Sehr gut auch für Garnelenbecken geeignet. The small shrimp graze the moss balls you up and gather around and between the moss balls. Arrived very well and my Red Cherry Shrimps love it ! Very nice! My blue pearl shrimps like to take it easy on them and so does the snails. The quality is very good and they were nice, green and healthy on arrival (they still are). I am very pleased with the price, size, quality and shipment of them. I have to say that they are easy to place in an aquarium because of the roundness, they sink to the ground and stays there unless you make movements that makes the water circulate to hasty. I really like this product and I'm very happy I bought some for my shrimp aquarium. This one is very hardy and survives almost everything. I believe it is very hard to place in the aquarium because of the round form. It is very light and almost bounces from one end to the other if a fish happens to push against it. It is possible to propagate by cutting it. But the new babies are not as easy the get round. When this one has grown a while (it grows very slowly) it is not as round as when buying it. The roundness is dependant on the constant movement where it grows and is harvested. Very hardy! They were frozen on arrival (I live in Sweden and it was -15 degrees on the date of delivery) but seems to have survived despite that. Bigger than I thought it would be, about 6-7 cm. Marimo balls are very beautiful moss and if you have them in the tank where you have fry the fry you will see them eating on the marimo balls the micro organisms that lie in the marimo moss balls. 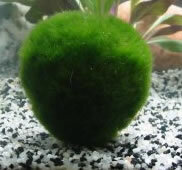 If there is not enough oxygen on the bottom of the tank the marimo balls float on the surface. Safely packed. Seems to grow nicely. Bolas grandes e verdinhas. Os meus camarões nunca se fartam delas. Very good quality, very nice and big and best part they're dirt cheap. At my LFS price is around 5 euro's for just 1 (smaller) mossball. Recently got 2 balls and I got 1 long time ago in the winter. All of them arrived in perfect condition. Even though it is slow growing plant, it is growing really fast! Just love this plant! Shrimps love it as well! I ordered 3 balls. They arrived in very good conditions. 2 of them were floating at the beginning but after a couple of days sunk. Very good. Remember to roll them sometimes to keep spherical shape. huge balls, much bigger then expected! after 7 days delivery, it was little tatty. Arrived in 9 days. This is very tough plant, first looked very suffered and brown. Recovered at the moment and is doing fine. The "balls" look really nice and bigger than I thought! Thank you! Very beautifull plants, i buyed 20 pieces for my aquariums, the shop shipped to me, from 3 cm to 5 cm diameter plants, i love cladophoras. very nice moss ball! Thank you! Size of the ball was 3 - 4 centimeters. Very nice and something different from other plants. Fun and easy to change location of the ball every now and then. very cute, cheap and resistant. Really big and cool plant. Good for shrimp! Excellent, cheap and very resistant, survives almost everything. Came to me in perfect condition, both marimos were wet, well packed. I gently rinsed them in warm water for few seconds and placed in aquariums. My cherries almost immediately "attacked". Highly recommended, thanks! Good shape and good quality. Perfect for shrimps. My shrimps love it. Nice dark green ball. Thx!